No basking shark fishing is allowed inside the 12 mile no-take zone. This is marked by the blue-dotted line arround the the British coast. Dr David Sims has shown that tagged basking sharks spend 80% of their time out of this safe zone so ideally protection needs to be extended. Basking sharks were first named as a protected species on the Isle of Man under the Manx 1990 Wildlife Act. The basking shark is listed as a protected animal under schedule 5 of the Wildlife Act (1990). Under section 9 of the Wildlife Act it is an offence to kill, injure or catch basking sharks. It is also an offence for someone to have in their possession a basking shark or any part of a basking shark or product derived from a basking shark. Selling or transporting basking sharks or their parts or products is also an offence. The Wildlife Act also states that it is an offence to damage or obstruct access to an area used by basking sharks for shelter or protection or to disturb a basking shark whilst it is sheltering or seeking protection. 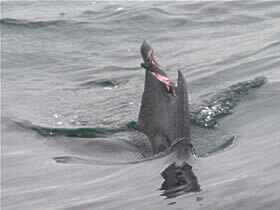 Examples of possible offences under the Wildlife Act (1990) would be to injure a basking shark with a boat propeller, to disturb basking sharks with jetskis or to be found with a basking shark fin aboard a boat. The person who damaged this basking shark off the Isle of Man, presumably in early July, would be open to prosecution under the Wildlife Act (1990). England, Scotland, and Wales have protected the basking shark in coastal waters, up to 12 nautical miles offshore, since 1998 when the 2nd review of the Wildlife and Countryside Act (1981) came into effect. In England, Scotland and Wales basking sharks and cetaceans are also protected under the Countryside and Rights of Way Act (CROW), 2000, from harassment and disturbance. The Northern Irish government has its own Wildlife Regulation Order (1985). The species is currently being reviewed for inclusion in the WRO. The review is likely to go out to consultation this summer, June/July 2005. In 2000 the basking shark was finally listed as ‘vunerable’ on the IUCN (International Union for the Conservation of Nature) red list and as endangered for the NorthEast Atlantic. The IUCN red list has associated recommendations but no obligations. Implementation of the red list relies on the laws of each individual country. The Isle of Man government was instrumental in urging the UK government to push for a CITES (Convention on International Trade in Endangered Species) listing. This was supported by a wave of public support encouraged by Ken Watterson’s Basking Shark Society. In 2002 the UK government successfully proposed to list the basking shark on Appendix II of CITES. This compels signatory countries to prevent trade in species listed. Basking sharks are protected in the Mediterranean under the Bern Convention and the Barcelona Convention (unratified). They are also protected in US Atlantic waters. There is no protection in the waters of Eire. Until 2003 Norway still had an EU quota that allowed them to catch 400 tonnes of basking shark liver, approximately 250-300 basking sharks. It seems that this fishery has now stopped because of economic reasons. There is a basking shark Species Action Plan that aims to further research and to provide protection for the basking shark. Lead partners are the Wildlife Trusts, The Marine Conservation Society and The Shark Trust. This is part of the UK Biodiversity Action Plan. However, with all this protection, until November 2005 the species was only protected inside the 12 nautical miles (nm) limit! Dr David Sims showed that tracked basking sharks only spend 20% of their time within 12 nm of the coast. They therefore spend 80% of their time in a zone where they are not legally protected! This information about basking shark movements plus data compiled by the Marine Conservation Society (UK) was used to support a proposal that they be protected in international waters. In November 2005 Basking sharks were added to the Bonn Convention on Migratory Species and as a result the North Atlantic Fisheries Commision recommend that there be NO FISHING FOR BASKING SHARKS in the North Atlantic. This was initiated by the MCS to whom all our Isle of Man data is sent. Good result!